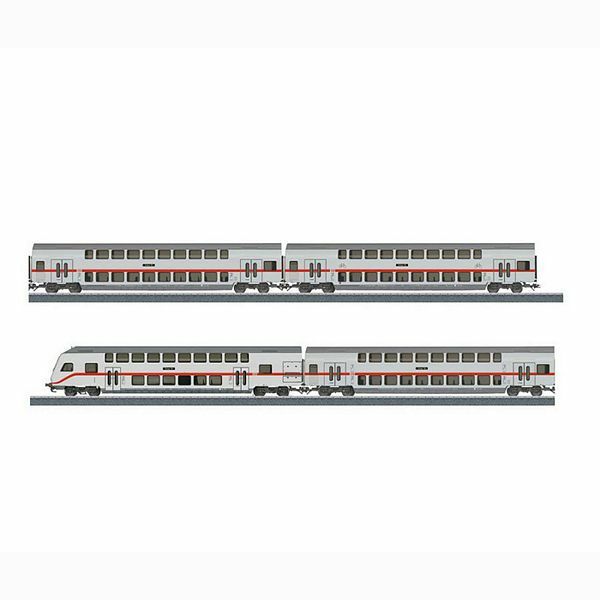 Prototype: German Railroad, Inc. (DB AG) 1 bi-level car, 1st/2nd class, 1 bi-level car, 2nd class, 1 bi-level car, 2nd class with a bicycle compartment, and 1 bi-level cab control car, 2nd class. IC paint scheme. Model: All of the cars have tinted side windows and close couplers. The cab control cars have red marker lights and white headlights that change over with the direction of travel. Total length over the buffers 107.7 cm / 42-3/8". The class 146.5 electric locomotive goes well with these cars and is available as item number 36620.